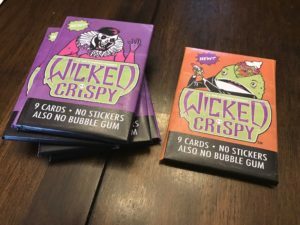 Get your SUPER LIMITED EDITION Wicked Crispy trading cards while you can! Only 100 packs created total. Several comic conventions coming up over the next few months and I doubt they’ll last that long. There are a total of 10 cards per pack and ALL packs are the SAME. (I repeat, there are only 10 different cards in total and all cards are in each pack so if you purchase more than one pack, you will be getting 2 identical sets of cards.) You can however, choose the wrapper if you so choose.